Ludwig van Beethoven: Symphony #9 "Choral"
Franz Schubert: Quintet in A Major, D.667 "Trout"
BMG Classics might be no more, but BMG Entertainment continues to release classical music. This is the latest batch of releases in the High Performance series, an audiophile collection that preserves some of the label's best recordings from the era between the end of Living Stereo and the maturity of the digital era. 24-bit resolution and 96-kHz remastering help to make these discs some of the warmest, richest, and most detailed recordings on the market, and their dynamic range is unusually wide. 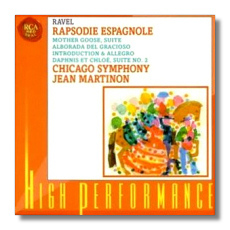 Jean Martinon's Ravel disc is a treasurable souvenir of his relatively brief tenure with the Chicago Symphony Orchestra. The Daphnis suite was taped in 1964, shortly after the Reiner years came to an end, and the other four works were taped in 1968, right at the end of Martinon's time with the orchestra. He would go on to make new recordings of these works with the Orchestre de Paris, but the virtuosity of the Chicagoans and the recording engineers put this disc in a special class. The Rapsodie Espagñole is magically sensuous, especially in the opening "Prélude à la nuit." Throughout, Martinon precisely measures and mixes Ravel's ingredients, and the result is a heat-producing chemical reaction which belies the conductor's control. There's nothing cold or calculating about this musicianship – just red-blooded excitement. Martinon presents Alborada del gracioso as a cool impressionist sketch to contrast with the Rapsodie's expressionism. In Ma mère l'oye, Martinon turns story-teller, and is tender, gentle, and ever so lightly sentimental. Only in the final "Le jardin féerique" does one look for a little more spectacle. The Orchestra's principal harpist (Edward Druzinsky), flutist (Donald Peck), and clarinetist (Clark Brody) excel in the Introduction and Allegro, a piece as gorgeous as it is underplayed. Finally, in the Daphnis suite, Martinon's long-lined sensuousness makes one regret only that he didn't record the entire ballet for RCA in Chicago. These were good sounding LPs, and these digital remasterings uncover even more warmth and detail. 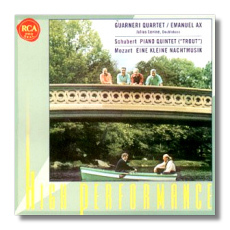 Schubert's "Trout" Quintet is practically indestructible, whether it's played for charm or for drive. The Guarneri Quartet (actually, just violinist John Dalley, violist Michael Tree, and cellist David Soyer here), joined by Emanuel Ax and Julius Levine, usually take an uncontroversial, middle of the road approach. The tendency, however, is more towards to New World than to the Old, and so the odd-numbered movements purr along efficiently with plenty of vigor and display. The slow movement and the variations themselves are more relaxed, if not particularly distinctive. Dalley's pinched tone in the upper registers may be wearing for some listeners. This recording was made in 1983. Mozart's equally popular Eine kleine Nachtmusik is done here as a string quintet, with violinist Arnold Steinhardt rejoining the other three members of the Guarneri Quartet, plus Julius Levine. Scholars believe that this is how Mozart intended the music to be played in the first place; the string orchestra version that usually is heard might not be authentic. The work loses nothing when it is played by only five musicians, and, unsurprisingly, it is that much more intimate. Again, the Guarneris plus Levine are efficient and reliable, but not gifted with an excess of Central European "glow." This was recorded in 1980. The early digital sound is good, but with passing moments of roughness. At its initial release, Ozawa's Philips recording of Carmina Burana eclipsed this Boston version from 1970; now it is time to reassess Ozawa's earlier thoughts. Admirably, he downplays Orff the vulgarian and shapes this most popular of 20th-century choral works into something more than just a series of orgiastic bangs and crashes. When Orff asks for slow tempos, Ozawa is slow indeed, creating an almost hypnotic state in parts of "Uf dem Anger." Elsewhere, he is fast, but not ridiculously so, and unlike some other conductors, when Ozawa sets a tempo, he holds it, unless Orff requires him to do otherwise. Mandac's solos are not very interesting, yet she sings prettily enough. Kolk makes a good effect in the "roasted swan" song, and Milnes is sexily (but subtly) charismatic in his solos. The choruses are a mixed bag. The New England Conservatory Chorus has rough moments, and the tenors are weak. Still, the group has spirit, and it is funny to hear some of the choristers dramatically rolling their r's while others sing the Latin text with an obvious American accent. The children's chorus is tentative. 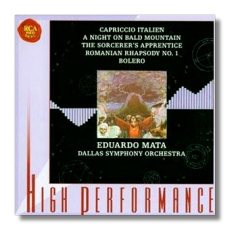 The remastering gives this recording impressive clarity but less impressive weight. Texts and translations are included. Also released in this batch of High Performance discs, but not received for review, is a live recording of Vladimir Horowitz playing Rachmaninoff's Third Piano Concerto at Carnegie Hall on January 8, 1978 (09026-63681-2). 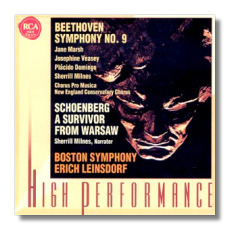 As I remember this performance, Horowitz is very exciting, but he approximates many of the concerto's most virtuosic passages, so this disc doesn't show him at his best. Still, it's hard not to scream along with the audience once it is all over. (Eugene Ormandy conducts the New York Philharmonic). The coupling is Rachmaninoff's Second Piano Sonata.